Once the Grenadiers have finished their foot drills and maneouvers, it is time for the Drums of the Royal Newfoundland Regiment of Foot to take the field. The combination of fifes, bass, tenor, and sheepskin snare drums immediately captures the attention of the audience. Lead by the Band Major spinning his mace and directing their movements, the Drums perform an impressive array of maneouvers while playing a combination of time period and traditional Newfoundland music. To finish their display the Drums march and stop directly in front of audience members, where the fifers steal the show with their solo. And then it is time for the talanted drummers perform their infamous solo known as the "Drummer's Call"! 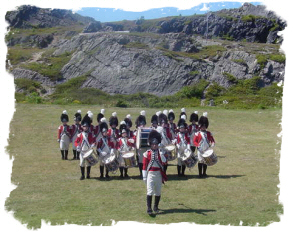 The Fifes and Drums perform in the Signal Hill Tattoo every Wednesday, Thursday, Saturday, and Sunday at 11:00am and 3:00pm at the Signal Hill National Historic Site from July to August. Click here for directions to the show, and click here to learn all about the drums, its music, and its history.